New World Natural Brands (“NWNB”) is a rapidly growing holding company investing in natural and organic products companies in the health and beauty space. It is owned by EFR Inc., C3 Capital Partners, and a group of private investors. The company is led by Chairman Ed Ryan, COO Jim Watt, and CFO Robert Kurilla. BaeTea is a lifestyle company selling health and beauty products online. The company owns the brands, BaeTea Teatox and BaeBody. BaeTea Teatox is a blend of traditional organic herbs that aids in digestion. It is Amazon’s choice for Teatox solutions and has become one of the largest Teatox companies on the Amazon platform. BaeBody is a leading skincare retailer on the Amazon as well, selling retinol moisturizers, body scrubs and eye gels. Through our relationship with business brokers at WebsiteClosers.com, we were introduced to the founders of BaeTea. 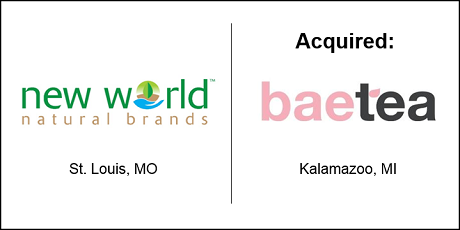 As conversations continued, it became apparent that BaeTea’s quality products, strong presence on Amazon, and established management team made the company an ideal acquisition opportunity for NWNB. The transaction closed on March 19, 2018. BaeTea’s management team will join the NWNB team and continue to operate BaeTea along with other opportunities in the NWNB family of brands. NWNB will continue to pursue acquisition opportunities in the natural products personal care space as part of their strategic plan.